Anyway I will be moving within the next month and I’m going to try to do my best to cook and bake away so that I have some things for you for Thanksgiving. I think this year calls for a pie (or two! ), probably a good healthy casserole and some other things I’ve yet to dream up. If you have any requests, please please please let me know! I thought this salad would be quite perfect for a Thanksgiving side dish or just anytime you see kale on sale (which you will – it’s kale season!). OR if you’re like me, you might just want to eat clean this next month until we get into cookie season where everyone will be baking an obscene amount of baked goods. This salad is top notch guys. Like so DAMN tasty. I actually tried to recreate it from one of my favorite salads from Whole Foods. It’s called Kale and Brussels Sprout slaw and it is INCREDIBLE. All the Whole Foods employees in Minneapolis know me because I’m in there nearly every day ordering this salad. Actually they probably know me because I shop there nearly twice a day and pace the aisles but whatever. But yes, you should definitely put this on your Thanksgiving list. It’s crunchy with a nice tang from the dressing which melds perfectly into the kale so that it isn’t bitter. The cranberries give it a little sweetness while the toasted almonds provide a nice crunch and nutty flavor. 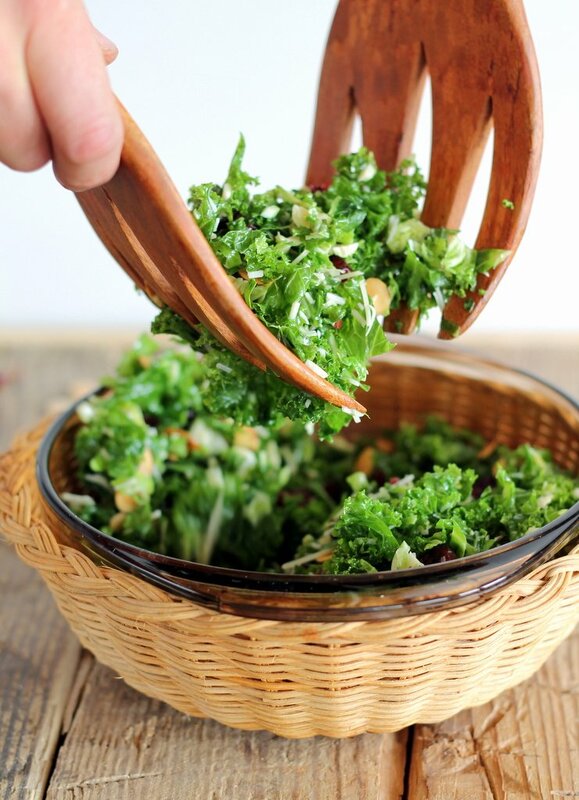 Everyone will love it – even people who don’t like kale. Enjoy! 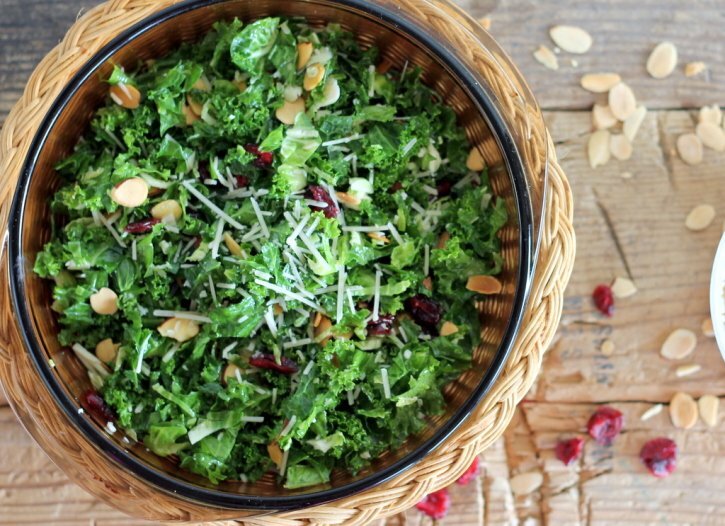 A delicious brussels sprout and kale salad with toasted almonds, parmesan and cranberries. 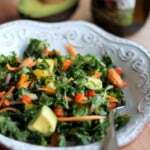 Everyone will love this incredible salad! Wash both Brussels sprouts and kale. Trim the sprouts and cut them in half lengthwise then slice the sprouts to give you fine ribbons. For the kale, discard stems and finely chop kale. Add both the sprouts and kale to a large bowl, then make the vinaigrette. To make the vinaigrette: combine olive oil, garlic, vinegar, dijon mustard, lemon juice and salt and pepper in a medium bowl, whisking to combine. Add to salad mixture and massage the vinaigrette into the kale for two minutes. This will help to make the kale less bitter and soak in the flavors. Add in cranberries, tossing again to combine. Cover salad and place salad in refrigerator at least an hour and up to overnight. This helps the flavors soak in and breaks down the kale. I find that the salad is always better the next day! While salad is marinating or before serving, preheat oven to 350 degrees F. Add sliced or chopped almonds to a baking sheet and place in oven for 10-12 minutes until slightly golden and toasted, flipping almonds once halfway through. Once ready to serve, add toasted almonds and parmesan to salad; toss to combine then serve in salad bowls. Garnish with more parm or almonds if desired. Serves 6. 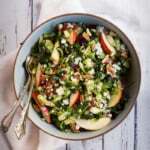 28 Responses to "Kale and Brussels Sprout Salad with Cranberries & Toasted Almonds"
I’ve made nearly the same salad. The only exception was that I put quinoa in it. I discovered it at Modmarket. Do you have one of those? It’s the best place to eat for salads. This is my kind of salad! I wish I had one for dinner tonight! Definitely my kind of dinner. 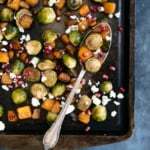 Bring on those sprouts!! Brussel sprouts are one of my fav. veggies! Can’t wait to try it – and that dressing – Yum!! 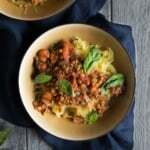 I need some ideas for a vegetarian main dish for Thanksgiving! 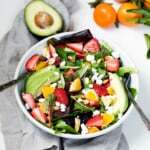 I love coming across new salad recipes and combinations to make myself for dinner during the week, so thanks for sharing this kale and brussels sprouts salad. 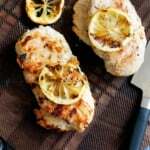 You can definitely consider I will be recreating the recipe! Excited to read about your new adventures in Chicago!! I’m in Lakeview too–It’ll be interesting to see the city through your eyes. Yummers! I love the festive touch with the cranberries! Ive made this salad twice already (and am about to make it a third time for my office), and both times it received rave reviews! I’m not a fan of dried cranberries so I subbed them out for dried cherries, and I usually just slice the brussel sprouts in my food processor. Wonderful salad. This looks awesome! Are you still in Chicago? I was born and raised in the suburbs! We moved a couple years ago and I miss it every.single.day! The food. Oh so good! 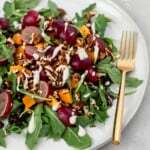 I came across your recipe in an effort to imitate my favorite salad from Dish Society! I must admit, I came pretty close and I’m so happy!! I substituted cranberries for golden raisins and dried cherries and added a few fried brussel sprouts on top and mixed in some red quinoa. Thank you so much!! Do you add the zest to the vinaigrette mixture? Do you mince the garlic? What is the measurement for a each serving? Each serving is 1/6th of the whole thing – I haven’t measured it out exactly (an eyeball should be just fine). I calculate the nutrition by dividing! There is a glitch when trying to print this recipe. Of course! Hope you find some that you love.